I totally missed this paper in the catalog until one of my stampin’ friends started talking about how it was as elegant. I see why I missed it, the picture was gray in the catalog so I just zoomed right by it to the next colorful paper. After I actually read the description, I discovered it very detailed laser-cut paper that was white on one side and vanilla on the other. So I ordered it and it was very interesting. 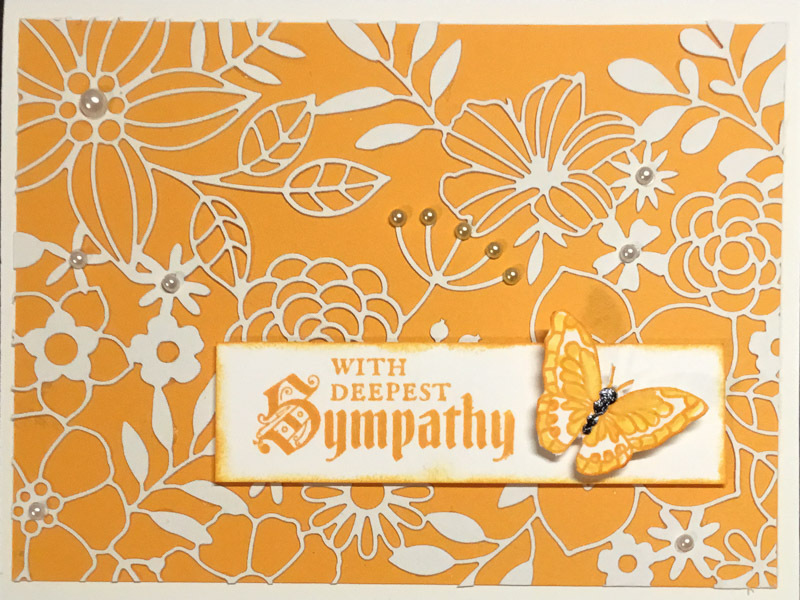 I made a sympathy card using the sentiment and butterfly from the Painted Glass stamp set. I used the vanilla side with the SU very fine tip glue to attach the laser cut piece to the Mango Melody paper. I fussy cut the butterfly (those antennas were originally much longer, tiny snip in the wrong place lol). I always say there are no accidents in stamping, just happy coincidences! Here is my supply list. Click on any item to order! Remember to use this month’s hostess code BBD2PTVN to get your free gift from me! That paper is so delicate and gossamer! It’s really beautiful. I must have overlooked it, too. Are you sure it was me? I looked at everything on Instagram that I posted and don’t see anything about markers. Beautiful card. This paper is so lovely.